Powerful pre-built integrations give you a fast and easy way to electronically sign documents, send documents out for signature requests, and take critical actions from within the Google products you already use. Grow your business with the only eSignature solution recommended for G Suite. Deliver an intuitive user experience and simple setup—for convenience people will love. Stand out from the crowd with fast, reliable digital agreements and approvals. As a “Recommended for G Suite App”, DocuSign integrates directly with Google Cloud solutions. 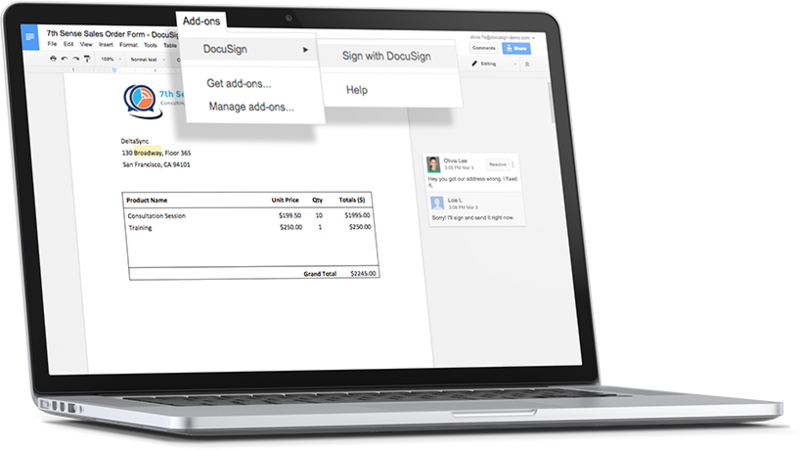 Integrate DocuSign with G Suite to start signing directly from Google Drive and Gmail. From the same place you create, edit, share, and store your files you can now sign documents and send documents out for others to sign. Eliminate the unnecessary steps of printing, scanning and faxing documents. Improve your productivity with the integrated workflow of DocuSign for Google Drive. 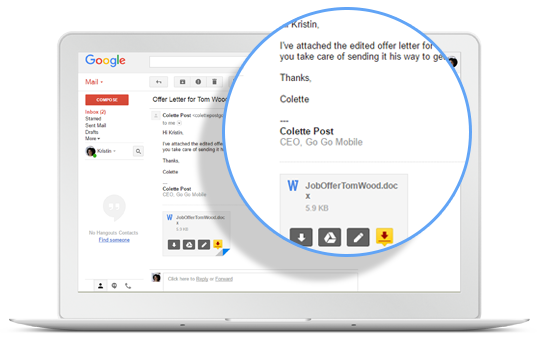 Hover over an email attachment to quickly sign documents without ever leaving your inbox. You can also request signatures from others with just a few simple clicks. Save precious time and money by streamlining your workflow. Save time by going from editing a document to sending and signing without ever leaving Google Docs. Once a document’s been completed, simply select which Google Drive folder to save it to. We've partnered with LegalZoom to bring you a standardized, DocuSign-enabled mutual NDA template to help get you started. 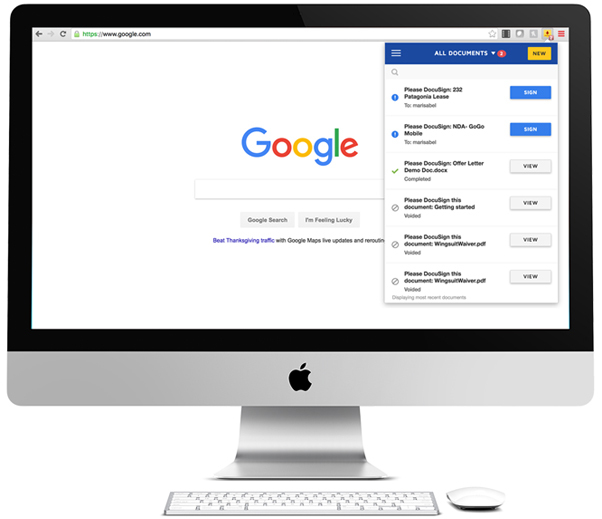 DocuSign's Chrome Extension enables you to sign, send, and manage documents directly from your Chrome browser. Once you’ve installed the app, you will have instant access to DocuSign from your favorite apps such as Gmail, Dropbox, and more. Send from the road, sign on the plane, manage from your couch. 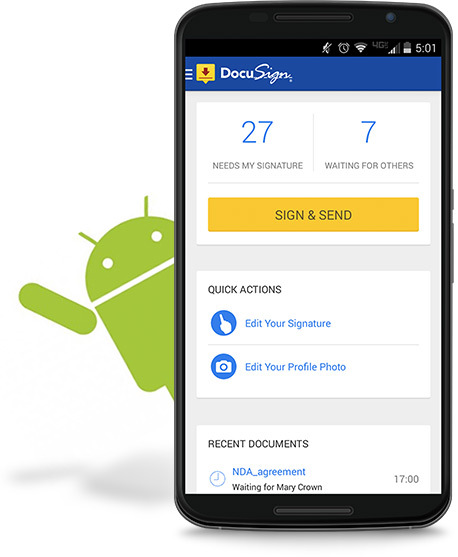 DocuSign from any device. With the DocuSign mobile app, you can sign, send, and manage your critical documents from anywhere at any time. As a realtor, I review and sign a lot of documents every day. Using DocuSign for Google has been a seamless experience. Rather than saving documents, uploading, signing and then bringing it back to send, I can do it all from Gmail. The migration is simple and everything is automatically sent back to clients. I save 5-10 minutes on every transaction and I can’t say enough about how easy it is to use. Can I use the Google Apps with my existing DocuSign account? Yes, install the app and login with the same username and password you use when logging in from the web. All your documents and activities will sync across all your devices into one centralized DocuSign account. Do I have to have a DocuSign account to use the DocuSign Google apps? You can download/install any of the Google Apps and create a free DocuSign account directly within the app to get started. Signing is always free and you are able to send 3 free signature requests with your free account. Install the apps today! I don’t know what my username and password is. You can access your DocuSign account directly from Gmail, Drive, Chrome, the mobile app, or by logging in at www.docusign.net. If you created your account via the Google app, you must log in using Google Connect across the different applications. Is there a different app for Gmail vs. Google Drive? DocuSign for Google Drive works with both Gmail and Google Drive. Install the app once and use DocuSign directly from Gmail and Drive. To open in Gmail—simply click on the attachment in your email, click the “Open with” button, and select “DocuSign. If you dont see DocuSign, go to“Connect More Apps”. 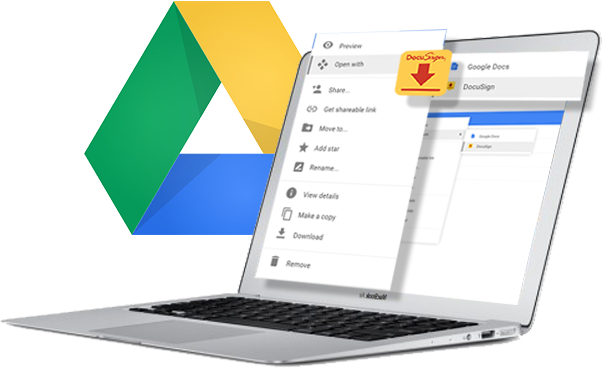 To open in Google Drive—Access any document in Drive by right clicking the document, select “Open With”, and select “DocuSign”. Ready to get started with DocuSign for Google?